Nearly two years ago, I was sitting in an uncomfortable chair in the emergency room. Despite the busyness of the nursing staff around me, I felt alone, and scared. It was after midnight, and my husband had been whisked away to have tests done. Several hours later, I knew something was wrong, when three grim-looking doctors came into the room. They explained that my husband did not have a concussion as previously thought, that he had actually experienced a stroke. My heart began to pound, my hands shook, and a flood of emotions raged in my chest. However scary that moment was, in just a few months, I would be praising God that my husband had that stroke! For it was because of an imaging test done that night, that his thyroid cancer was discovered. Yet, at that moment in the emergency room, I was not very thankful. A year later, after my husband’s thyroid had been removed, and his radioactive iodine treatment was complete, I was once again, sitting in another uncomfortable chair. This time, in a hospital room, next to my husband’s bed. I was holding his hand., as another surgeon explained to us that my husband had stage 3 colorectal cancer. I’m pretty sure I had a hard time expressing thankfulness at that moment. Yet, here I am today, expressing deep thankfulness to my Heavenly Father! Not only for the trials He allowed in our lives the last two years, but for His kindness. Our family is a living testament to the fact that God is kind to the unthankful! Despite the fears and the sorrows we have had in the last 2 years, God has showered us with His tender care. He showed us kindness through His comforting word. There is something about the scripture that comes to life when you are walking in a valley. Suddenly, verses you have read a hundred times before, have new meaning and understanding. Comfort and hope are found in abundance throughout the scripture! On the day that I watched my husband struggle to walk because of his chemo treatment, I felt the Comforter’s hand on my shoulder as I was reading Psalms 139. Yes, God is kind to the unthankful! He showed us kindness through our brothers and sisters in Christ. The visits to hospital rooms, cards in the mail, hot meals, and thoughtful gifts to our family, all helped to ease our present suffering. One day, I had found myself standing in the adult diaper section of the grocery store. I was angrily swiping away tears, trying to decide what size my husband would need. Once I got home, I had allowed myself to become filled with rage. How could radiation do this to my husband!? Throwing open the mailbox, I angrily yanked out the package that was tucked inside. The return address showed it had come from dear Christian friends who recently moved to Florida. Angrily ripping it open, the first thing I pulled out was a package of Dove chocolates – my favorite! Suddenly, my tears of anger had changed into tears of thankfulness that God would be so kind to unthankful me! He showed us kindness by providing our needs. Because of the aggressive treatments, my husband had to cut back his work hours. Yet, we never missed paying a bill, we never missed a meal, we never had to wear clothes with holes in them, and our vehicles continued running! Once, toward the end of my husbands treatments, we realized we wouldn’t be able to pay the kids school bill. I made arrangements with the principle and the business office to delay our payment. We weren’t sure how we would be able to pay it. We never mentioned our financial situation to anyone, not even family. Yet, a few days later, we received a card in the mail with money in it- more than enough money to pay the school bill! God showed us kindness by making provision for our every need! He showed us kindness by answering prayer. God not only answered our own personal prayers, but also the prayers of others who were praying on our behalf. During the moments we had reason to be afraid or down, our spirits were lifted. My husband was positive about his cancer prognosis, and I never once struggled with anxiety! Those things alone made us know that we were being covered in prayer. When my husband’s chemo had become particularly difficult, he had an appointment with his oncologist. The doctor asked if my husband needed a refill on his pain medication. When he learned my husband wasn’t taking pain medication, he was shocked. “In all my years of being an oncologist, you are my first cancer patient that hasn’t needed pain medication!” My husband replied, “that is because God is answering the prayers of my brothers and sisters in Christ!” Yes, God is truly kind to the unthankful! The wonderful thing about being a Christian is that God loves to shower His children exceedingly and abundantly beyond what they deserve or even ask! Here are just a couple more of the many little ways God was kind to us! 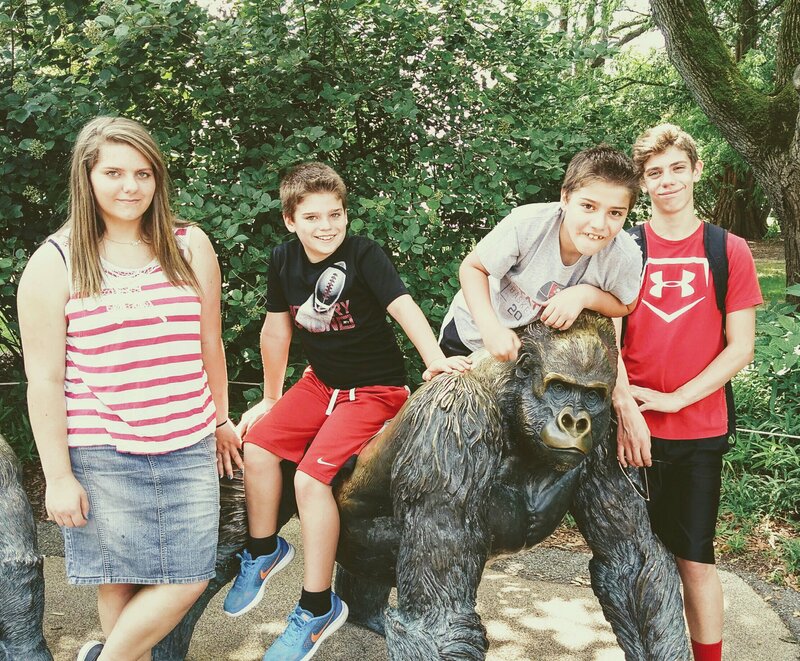 Last spring, we took a family trip to the Creation Museum. We were going to have to leave early because my son had broken the flat screen TV in our hotel room. We didn’t have the money to pay for it and eat the next day. Once we arrived at the museum, we bumped into some friends. I never mentioned the broken TV, but at the end of our conversation, the lady slipped me a handful of money and said, “God told me to give this to you.” Our family was able to stay the entire day as originally planned and pay for the broken TV! There was another time I was feeling particularly sorry for myself. My husband couldn’t get away from the cancer clinic long enough to go on our yearly camping trip. How I longed to get away from “cancer” for just one day! However, because of his weakness from treatments, my husband couldn’t camp in a tent. The cabins I had looked into were all booked up until September. During the last couple weeks of summer, I received a phone call from a campground. “We have an opening in a cabin you were asking about. Are you still interested in a one night stay?” Um, YES!! So this week, our family will be joining the millions of other American families who celebrate Thanksgiving. We will carve a turkey and watch football. We will eat pumpkin pie. We will play games and laugh until we cry. We will thank God for my husbands healing from his stroke, and his remission from his cancers. And we will be thankful for all the kindness our God has shown to us, when we were so unthankful! In January of 2015, my husband began rubbing his chest. “Was it a stressful day at work,” I asked? We had been talking for the last couple of months about how something had to give with Gabe’s job. Not only was he driving an hour to work, he was working 10 to 12 hour days before driving another hour home. It was starting to wear on him, and our entire family was effected by the high demands of his career. A few days later, Gabe started to have chest pain. It was enough to make him question if he was having a heart attack. It was time to go to the hospital. In the emergency room, Gabe’s heart rate was crazy. One minute it was 70 and the next it was over one hundred! After two days, the medications were not helping. They sent him home with a scheduled procedure for the next week. He would be having a heart ablation, a seemingly simple procedure where they pricked a tiny hole between the heart chambers and burned away excess tissue surrounding the heart. The procedure, though uncomfortable, was a complete success! We went through the rest of 2015 with no other health struggles or emergency room trips. Until, exactly a year later, in January of 2016. “I’m taking you to the ER”, I insisted as I drove my family home from church. “Just let me go home to bed”, Gabe argued. After finding a babysitter and getting my kids off to bed, I practically dragged my husband to the car. It didn’t take long to get him registered in the hospitals emergency room. After several hours of tests, two doctors came into the tiny room. My husband and I looked at each other in shock. He was only 45, after all. We were not expecting this kind of news until we were at least in our 70’s! The next day we learned that the stroke was more than likely the result of a blood clot that was thrown from the tiny pin-prick hole between his heart chambers. While they couldn’t prove it, it was the only theory that made sense. As my husband was being released with strict instructions for “no work, no stress, no noise”, we were visited by an endocrinologist. We were so focused on healing from the stroke, that we found we weren’t too worried about the mass on Gabe’s thyroid. A few months later, a biopsy revealed cancer. “It’s actually a blessing you had the stoke. Since you were not having any symptoms, we would have more than likely caught this cancer when it was much worse”, the endocrinologist explained. In July of 2016, Gabe had surgery to remove his thyroid. Cancer was found in three places. By September, he was finished with his radioactive iodine treatments. Gabe was back to healing from his stroke, and his surgery. By Thanksgiving Gabe was starting to feel pretty good. He had begun to return to the office a few days a week, and we were making some exciting plans for 2017. Only, Gabe had began to notice a lot of blood in the toilet. Realizing it could possibly be from the blood thinners he now had to take, he felt God was urging him to mention it to his doctor. In January of 2017, Gabe received a phone call from the gastroenterology. For the next two weeks, my husband and I struggled with our emotions. One minute we felt peace and complete trust in God and the next minute, fear and despair would overwhelm us. Hadn’t we been through enough? A heart procedure, stroke, thyroid cancer, and now colon cancer? After two weeks of grieving, the fog began to lift from our emotions, and we began to think more clearly about our situation. The worry wrinkle on my husbands face began to smooth away, as he began to understand my meaning. We sat together in awesome wonder. We really could trust God! He really DID know what He was doing! It was pointless to question Him! Not only had God allowed all of this struggle into our lives the last two years, but His hand was there the whole time, leading us. Excitement began to replace our wonder, and thankfulness. Yes, thankfulness. For the stroke, the thyroid cancer, and even this colon cancer. For all the time off work my husband had to take, the millions of doctors appointments and the growing pile of medical bills. For the stress of juggling crazy schedules, and the fearful thoughts of “what if”. We have witnessed God’s perfect timing, His perfect thoughts, and His perfect ways. We have received blessings from His hand through the giving hands of our brothers and sisters in Christ. We are thankful for all of it, because while it was difficult (I would be lying if I said it wasn’t), we have been able to experience God’s unseen hand in our life. This week marks the end of summer for our family. Monday beings the craziness of school, sports, and music lessons. While I’m sad to see lazy summer days go, I’m looking forward to getting back to a routine. This summer was more laid back than usual for our family. Because Gabe needed to be close to the cancer center, and because the treatments were making him feel sick, any overnight trips were difficult to plan. 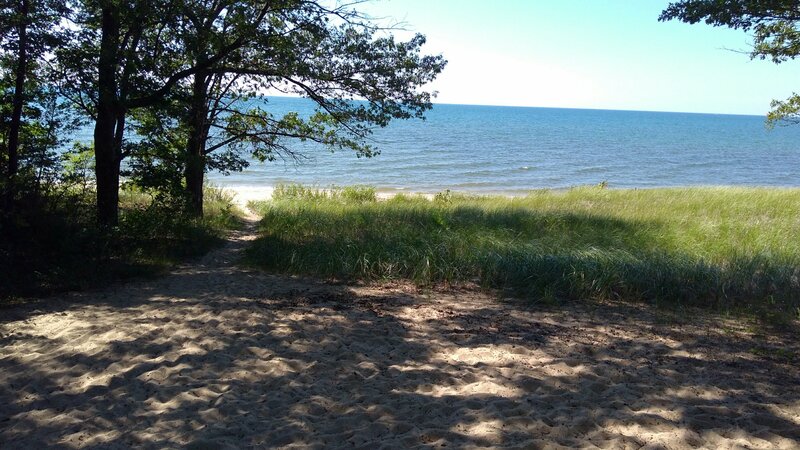 We did manage to get away for one night at Port Crescent State Park in Michigan! Their cabin that sleeps six had an opening at the last minute, and since Gabe had just finished his radiation treatments, we decided to go. It was wonderful! We had our own private beach right outside the cabin. I’m so thankful we were able to go! Our beach scene from the front door of our cabin at Port Crescent State Park. 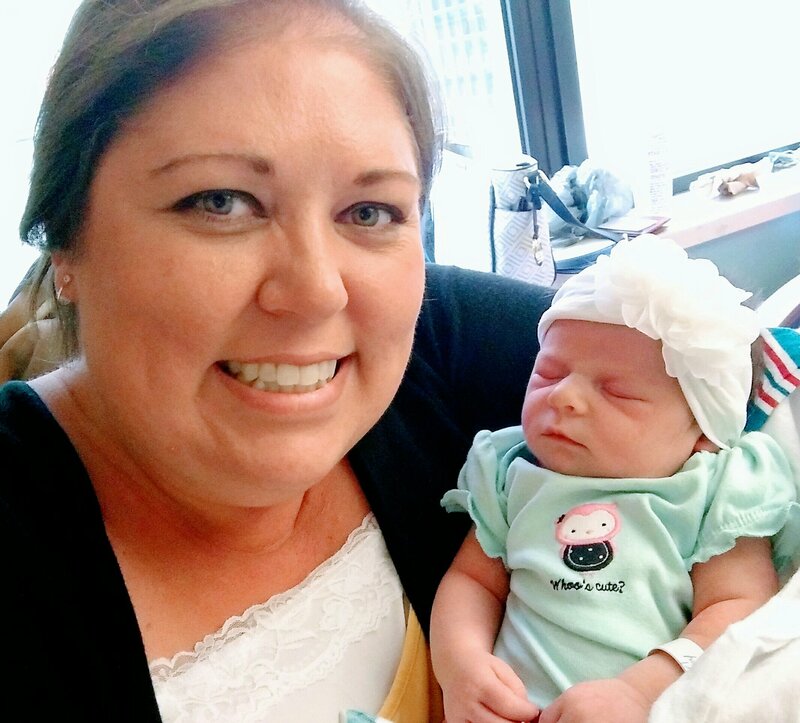 I also was able to make it to Lexington, Kentucky for a quick weekend to meet my brand new, great-niece! Kennedy Diane Calhoun is so precious, and I can’t wait to see her again soon! Welcome to the world, Kennedy Diane! Finally, I was able to take the kids to the Toledo Zoo. If you have never been there, you should go. The Toledo Zoo has been voted one of the top ten zoos in the United States. It had been a few years since we were there last , so it was fun to get to spend that time with the kids. Six more weeks and Gabe’s treatments will be over! Gabe will get a final scan to confirm the cancer is gone, and then declared NED (no evidence detected). After five years of being NED, he will officially be in remission! As I look forward to life returning to normal for our family, I also feel a little timid in leaving this valley behind. You see, God has been here with us. We’ve seen Him work miracles. He has provided every single need, and blessed us above what we ever imagined He would! The close fellowship I have had with Him, and the peace that I have experienced while walking through this valley with Him, has been life-changing. I’m thankful for how He led me through the most difficult time of my life! For me, this is not just the end of another summer. It is a beginning of a new normal. I don’t know what our new normal will look like. I do know I don’t need to worry. If I can trust God to get us through a difficult year-and-a-half, I can most definitely trust Him with normal!